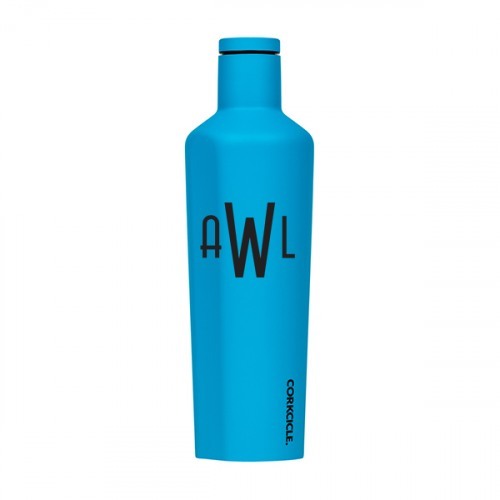 Personalize your Corkcicle at Swoozie's. The Neon lights collection brings electricity to every sip! With a new buttery soft touch neon blue finish that will make want to drink more than ever before! Corkcicle goes where glass can't! Enjoy your favorite cold or hot beverage anytime, anywhere with this canteen. Triple-insulated stainless steel easy-grip flat sides and no-slip bottom. Corkcicle Canteen keeps cool drinks cool for up to 25 hours and hot drinks warm for up to 12 hours. No cumber-some cooler needed and no annoying "bottle sweating". No freezing required. Just pour and enjoy! Personalize starting at only $10.00 to make the perfect personalized gift.